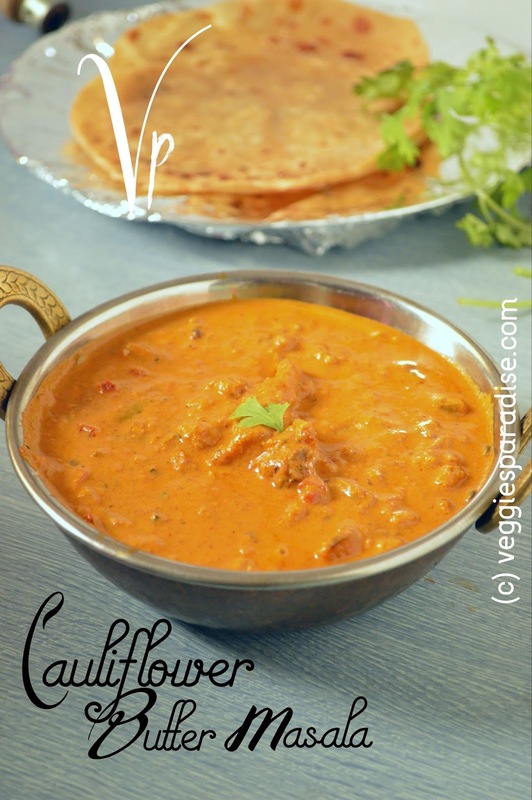 Cauliflower Butter Masala - This is a rich lip-smacking gravy that goes very well with roti's and naan. Having Cauliflower and wondering what to do, then friends I would say this gravy would be the best way to enjoy it. 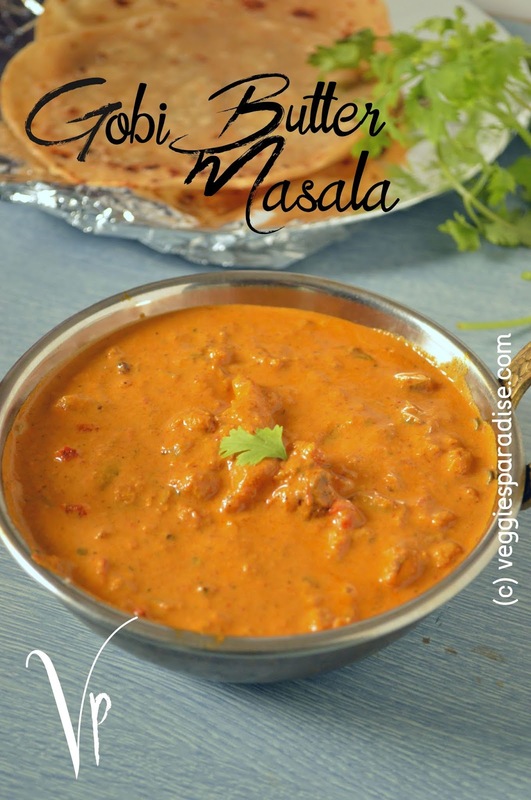 This is quite similar to the paneer butter masala recipe.There are quite few other versions in preparing this, but I find this version of mine simple and taste's delicious. I have not used much of spices if you want an extra punch you can add and adjust spices accordingly. It is very simple and easy to prepare so let's get started. First step : Wash and cut the cauliflower into medium sized florets . Boil water in a vessel with a pinch of turmeric powder. When the water comes to boiling add these florets , close the vessel. Remove from heat and keep aside for about 10 - 15 mins. This process of cleaning the cauliflower is to ensure that the florets are free from worms. Make sure that you don't overcook the florets in the water. Second step : Remove the florets from water and keep it aside. Third step: Heat butter in a pan and add the florets. Keep sauteing until they turn slightly brown ,at this stage add water .Cover and cook for about 5-10 minutes or until the florets turns tender and not mushy. Remove from heat and keep it aside. Fourth step : In the same pan , heat butter and add bay leaf, cardamom, cloves, cinnamon stick. Fry for a min. Add finely chopped onion and saute until they turn translucent. Add ginger-garlic paste and fry until the raw smell extracts . Sixth Step :In a grinder , add the cooled mixture and grind it to a smooth paste. Cauliflower butter masala is delicious and lipsmacking gravy. 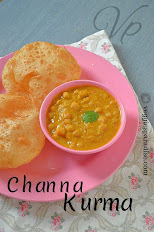 Have it with hot roti's or Naan and enjoy. Wash and cut the cauliflower into medium sized florets . Boil water in a vessel with a pinch of turmeric powder. When the water comes to boiling add these florets , close the vessel. Remove from heat and keep aside for about 10 - 15 mins. This process of cleaning the cauliflower is to ensure that the florets are free from worms. Make sure that you don't overcook the florets in the water. Remove the florets from water and keep it aside. Heat butter in a pan and add the florets. Keep sauteing until they turn slightly brown ,at this stage add water .Cover and cook for about 5-10 minutes or until the florets turns tender and not mushy. Remove from heat and keep it aside. In the same pan , heat butter and add bay leaf, cardamom, cloves, cinnamon stick.Fry for a min. Add finely chopped onion and saute until they turn translucent. Add ginger-garlic paste and fry until the raw smell extracts . Add in the chopped tomatoes along with few cashewnuts and spice powders.Allow the onions and tomatoes to get cooked well along with the spice powder. Once done remove from heat and allow it to cool for grinding. (Remove the bay leaf before grinding). In a grinder , add the cooled mixture and grind it to a smooth paste. Pour the sauce back to the pan and bring it to boil, add the cauliflower florets and allow it to cook for about 5-10 mins in a medium flame. Finally add fresh cream and crushed kasuri methi. Allow it to cook for few more minutes.Perk it up with fresh coriander leaves or with fresh cream. Serve and enjoy. Make sure you don't overcook the cauliflower. You can replace ginger-garlic paste by adding 3 to 4 garlic cloves along with a small piece of ginger while sauteing the onions and tomatoes. 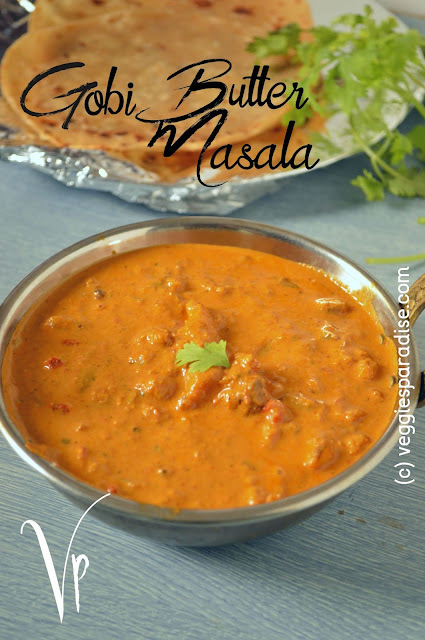 Don't skip kasuri methi as it enhances the taste of the gravy.